Reflux and Barrett’s disease: revival of endoscopic antireflux procedures? After the initial enthusiasm at the end of the previous century, interest in endoscopic anti-reflux procedures decreased due to inefficiency or complications with devices, a lack of good clinical trials, or financial problems of the manufacturers. In 2012 some interesting results on new and old devices have been published. 9 Rodríguez L, Rodriguez P, Gómez B et al. Electrical stimulation therapy of the lower esophageal sphincter is successful in treating GERD: final results of open-label prospective trial. 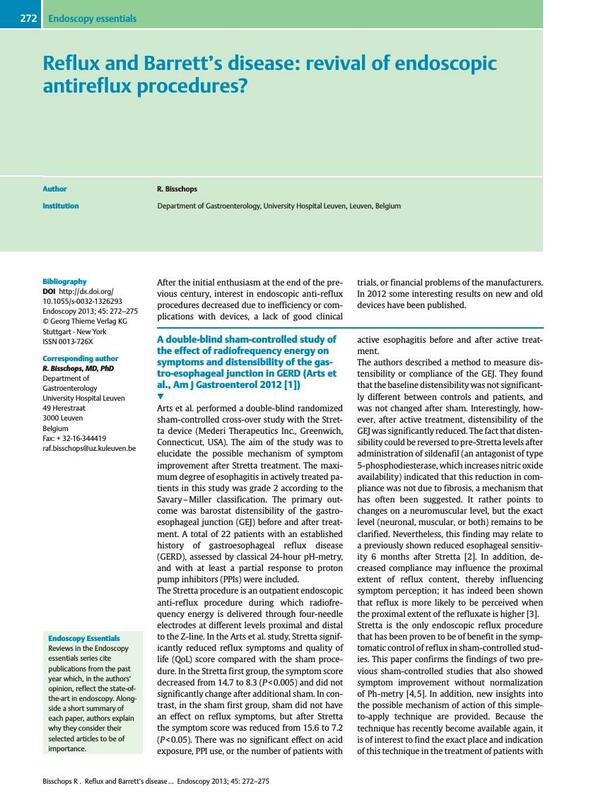 Surg Endosc 17.10.2012; DOI: 10.1007/s00464-012-2561-4.